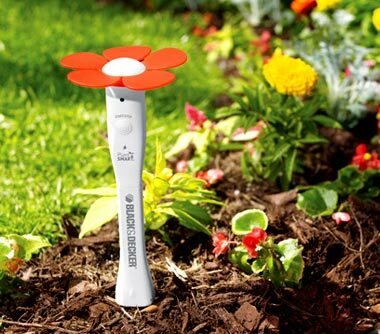 Black & Decker’s PlantSmart system is a digital sensor that you plant in the ground where you intend to grow some plants. The PlantSmart will then analyze the growing conditions of the soil, measuring things like temperature, moisture content and sunlight conditions. It can even measure the nutrients in your soil to determine which fertilizer will work best, but this feature requires an extra subscription. The PlantSmart works both indoors and outdoors, and connects to the PlantSmart website via a USB port. Once the collected data is uploaded to their website, you’ll receive a report that recommends the ideal plants for your growing conditions. There are actually three modes – recommend, monitor, and water. In recommend mode, place the sensor in the desired location for 24 hours and then plug it into your computer for a custom report. In monitor mode, place the sensor next to your indoor or outdoor plant for one full watering cycle. After you connect the PlantSmart to your computer and the PlantSmart website, you’ll receive advice about how to improve the health of your plant. Finally, in water mode, the PlantSmart sensor tells you when a plant’s soil is too dry and that it needs to be watered. I know that this is totally the wrong time of year to post about something like this, but it’s better too early than never! Edit: B&D’s giving a few PlantSmart units today over at Twitter. Check it out. While you’re at it, you can follow us as well.